Opel says its first CAYU store makes buying a car more casual, modern and simple. Opel is piloting a new retail format that offers German customers the opportunity to purchase a new car while shopping in a mall, mimicking a concept first developed by the UK’s Rockar dealership group for Hyundai. Dubbed CAYU, short for Car for You, the store is the latest attempt -- and the first in Germany -- at trying to link virtual and physical stores to create a complementary customer experience, integrating the two rather than creating competition that would increase pressure on brick-and-mortar dealerships. At the same time, CAYU also reflects a growing trend among carmakers that wish to make their brands more prevalent in consumers’ daily lives, rather than relying on customers to travel to a city’s less frequented outlying districts to visit one of their traditional showrooms. “People in metropolitan areas are used to doing everything close to the city center,” Opel Germany sales boss Juergen Keller said in a statement. Starting in September, customers in Stuttgart can order a preconfigured Astra, Corsa, Adam or one of Opel’s crossover models and finalize the purchase contract in a few clicks via an “eSigning” option. They can choose to do this either online via the www.cayu.com website or at a new 170-square-meter CAYU store at the Milaneo shopping mall, which is a 10-minute walk from Stuttgart’s main train station. 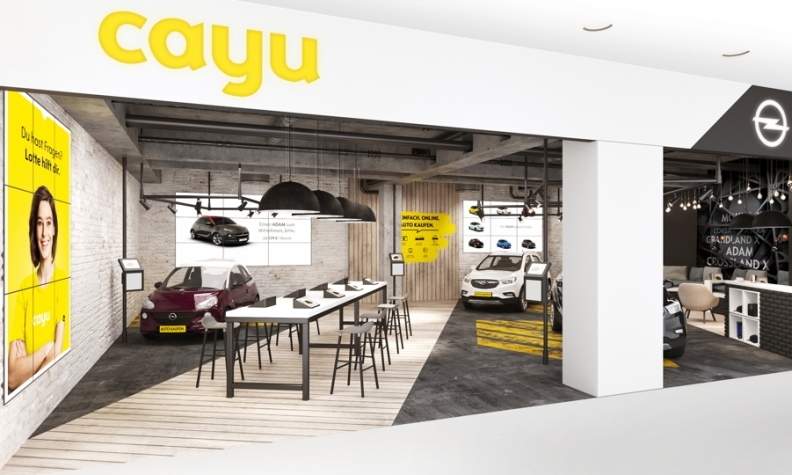 With the assistance of CAYU’s so-called “Insiders,” customers who visit the CAYU store can purchase an Opel in an atmosphere the company describes as “industrial meets urban kitchen.” Test-drives are also possible with the vehicles available right outside the mall. Prospective buyers can also begin the process virtually and complete it at the physical CAYU store, or vice-versa in a recent retail development referred as online-to-offline, or O2O. Delivery requires only about two weeks and customers have a 30-day return guarantee. “Buying a car cannot get any more casual, modern or simple. CAYU is clear, transparent and easily reachable -- just like Opel, it’s a modern brand that you can touch,” marketing chief Tina Mueller said in the release. While auto brands have experimented with temporary “pop-up stores” in malls, the CAYU concept comes the closest to Hyundai Rockar’s mall outlet at the Bluewater Shopping Center in in Kent, England, and is likewise operated by a dealer -- in this case Autohaus Staiger, Opel’s oldest franchise partner in Germany. “It cannot be any easier or quicker and there’s no risk,” Opel’s German marketing director, Christian Loer, said in the release, adding that the Stuttgart store is an important milestone for the brand. A spokesman for the company said customers in other parts of Germany would be able to order cars online via the CAYU website and have them delivered. When asked whether the pilot store concept would be introduced elsewhere in the country, he declined to comment.